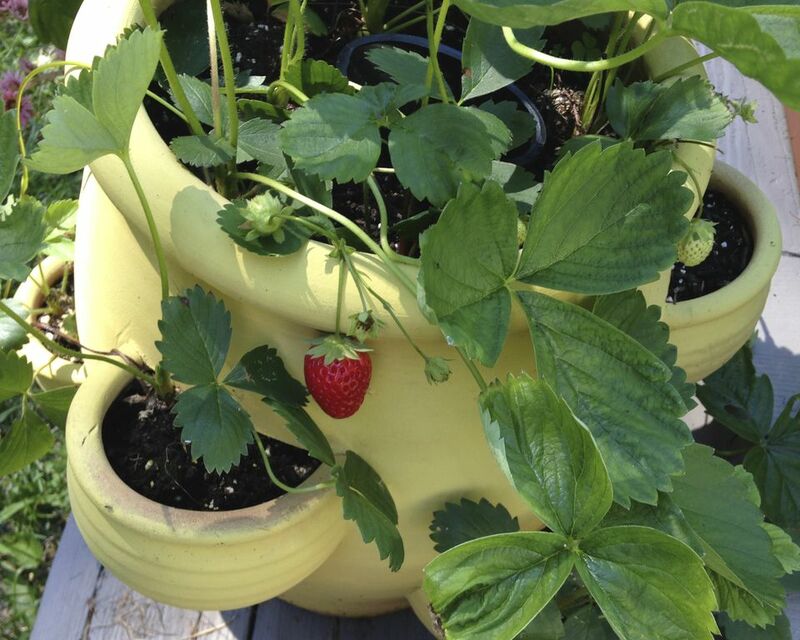 Growing strawberries in containers, garden pots or hanging baskets are easy and delicious. There is nothing like the taste of a fresh-picked strawberry still warm from the sun - it’s like a mouthful of magic. Strawberries are also beautiful--a great example of a plant that is as ornamental as it is edible. Strawberry pots (usually tall pots that have pockets) are, not surprisingly, perfect for growing strawberries. You can fit several plants in one pot. A strawberry pot is a particularly great way to grow strawberries if space is a consideration. Strawberries also look lovely in hanging baskets or ceramic pots. Whatever type of garden pot you use, make sure that it has good drainage. There are four different types of strawberry plants, June bearing, everbearing, day neutral and alpine. Alpine, day neutral and ever-bearing provide a longer harvest season. The alpines and day-neutral are particularly lovely to look at - bearing small, bright red, tasty berries all season long. Even if your strawberries are in pots, some plants will spread even beyond the pot, so if you don't want strawberries to spread into your lawn or garden beds, make sure to prune and plants that are getting out of hand. In early spring, fill your container with a good quality potting soil, adding a slow-release fertilizer, (first, check if the potting mix has it already mixed in). Plant your strawberries just deep enough so that the soil level of the nursery pot is at the same level as your potting soil. Be careful not to put soil over the crown of your plant (which is where the plant meets the soil). Most strawberry plants will produce most fruit if they are in full sun, though some varieties of alpines and day-neutral strawberries will tolerate part shade. All strawberries need consistent water to thrive. Keep the soil moist, not wet. If possible, water in the morning or during the day, not in the evening, to prevent disease. Always test your soil for moisture before watering by sticking your finger in up to the second knuckle. If the soil feels dry, add water. Fertilize with a diluted liquid fertilizer every other week. Try an organic fish emulsion, seaweed combination. If you live in a cold weather zone, move your strawberry containers into a protected area – preferably from 30-40°F. Check plants weekly, giving them just enough water, so they don’t dry out completely. Place them outside in the spring.